Aims at providing to the European and national stakeholders of the CAP validated algorithms, products, workflows and best practices for agriculture monitoring relevant for the management of the CAP. The Common Agricultural Policy (CAP) of the European Union aims at improving the European agricultural productivity in a sustainable manner while ensuring a decent standard of living of farmers within the EU. With an annual budget of roughly €59 billion, the CAP strengthens the competitiveness and sustainability of agriculture in Europe by a range of measures including direct payments, market measures and rural development. The largest part of the CAP budget is managed and controlled through its Integrated Administration and Control System (IACS) aiming to safeguard the CAP financials and supporting the farmers to submit their declarations. 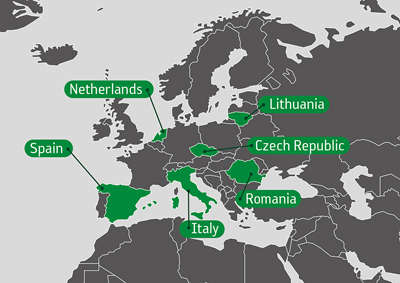 The IACS is implemented at national level through Paying Agencies of each EU member state. The current legal framework of the CAP from 2013 will be reformed by 2020 in order to modernize and simplify the CAP. In this upcoming CAP reform satellite Earth Observation (EO) is seen to take an increasing role for improving the IACS and making it more cost efficient. The Sentinels for Common Agricultural Policy - Sen4CAP project aims at providing to the European and national stakeholders of the CAP validated algorithms, products, workflows and best practices for agriculture monitoring relevant for the management of the CAP. The project will pay particular attention to provide evidence how Sentinel derived information can support the modernization and simplification of the CAP in the post 2020 timeframe. "...already Paying Agencies using data of the Sentinels [...] ESA has launched a tender Sen4CAP which will provide us useful knowledge and further possibilities on how we use Sentinel data in the context of the CAP"
Be notified about the progress of the Sen4CAP project.